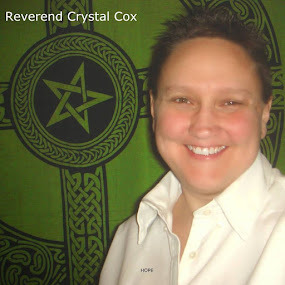 Reverend Crystal Cox, New Earth Ministry; Professional Psychic: Reverend Crystal Cox Quantum Healing Services. You are NOT alone. Reach Out and CHANGE your Life TODAY. Reverend Crystal Cox Quantum Healing Services. You are NOT alone. Reach Out and CHANGE your Life TODAY. Quantum Healing Services Includes: Quantum Readings in which I look at your oversoul, your programs or Enchantments and help you remove them permanently, look at what you are doing in your life to create right now, look at people in your energy field and give you an intuitive, clairvoyant, informational reading in order to help you understand and remove whatever is blocking you from the life you actually want. 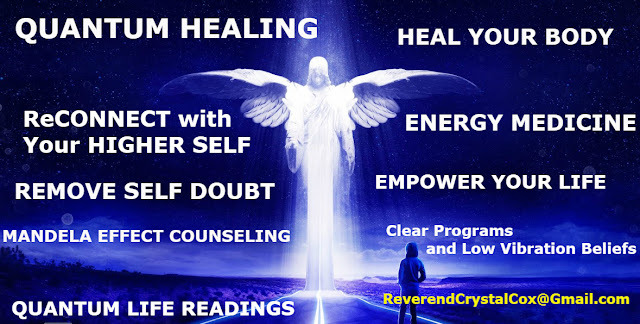 Quantum Healing is a hands on healing, a faith healing, a laying of the hands, an energy healing, running energy all to lend energy to your own innate healing process, assisting you to connect to your higher self and assist your innate to heal you on all levels. I have been healing with divine energy for over 30 years. Contact me today, we can do distance healing, we can do readings or healings over chat or email. Give it a try, see if you feel changes in your life and feel guided in the right direction. Contact me today to set up an appointment. Are you struggling with Self Doubt? Do others influence you to much? You are trying to work hard to “feel” like you “deserve” good things. That is a programmed belief. Underestimating your Worthiness? Break Free From Self Doubt. It is the Key to Everything. I can help guide you through what is blocking you to peace of mind, happiness, joy and abundance. I can assist you to re-align with your own inner guidance and your own innate healing. If you are experiencing the Mandela Effect and want a deeper understanding of what it means to your life, or need support as you go through it, I provide quantum energy healing to help you align with your innate, provide readings for your unique life and circumstances, and guide you to understanding what to do next. Take Charge of your Thoughts, your Programs, your Self Doubt and actively, moment to moment Create the life you really do want. If you find you are struggling doing this on your own, I provide Quantum Healing Service which include Quantum Healing on a cellular and energetic level, spiritual counseling regarding what is happening in your life at the NOW moment, and consulting on what to actually do right now to change and heal what you currently think of as your reality. You are NOT alone. Reach Out and CHANGE your Life TODAY.